Hand Painted Metal Tropical Wall Decor - Tropic Décor offers a large collection of hand crafted metal art designs, hand cut from recycled steel oil drums in Haiti. Haitian metal art. Outdoor metal art, Tropical wall art. See our large selection of hand painted tropical fish switch plate covers. 10% Discount ...... Receive a 10% discount on your order of $50 or more. Enter the code TDecor10 when placing your order. A grand choice of tropical designs for your home. Choose from tropical fish metal wall decor, hand painted metal art tropical fish, gecko designs in Caribbean colors, tropical home decor, tropical gifts, darling painted metal Caribbean house metal wall hangings, distinctive tropical parott wall art, an assortment of butterfly metal art, tropical design switch covers, tropical wall decor, tropical gifts and much more. Haitian metal art - All created from recycled steel drums in Haiti. I absolutely love this wall hanging. We live in a little coastal town where everyone decorates their exterior with a bit of whimsy. I hung this on my front door and it looks amazing. The colors are beautiful. The craftsmanship is superb. It arrived even more quickly than I expected and was well packed. I highly recommend this company. I love this butterfly! It is enjoying time in an indoor palm tree... and makes me smile! Gorgeous. This was my first experience ordering so it took some time to understand the delivery process. It gives that "islandy" feel I was going for. Cute, colorful, and great way to hold my potholders! It looks just like the picture. I got clear, friendly communication about my shipment and it arrived on time in excellent condition. From what I can see your art is fabulous. I am really looking forward to receiving these and have you on "my favorites". Based on what I see I am sure I will be ordering more from you in the future. You are very gifted and I find it amazing you can turn something most people would throw away into something so beautiful. I never knew that my beautiful switchplates were made in Haiti. My heart has hurt sooo much for all you beautiful people and all you have been through. I have one of your special switchplates in every room. I was sooo sad looking at the pictures of your of all that you have been through. I will continue to place orders and say prayers for a fast recovery for ALL OF YOU and your families. Thank you sooo much for the beautiful work you do for all of us. I am sooo proud of the beautiful switchplates that I have from your artists. All my friends comment on their beauty and I smile with pride. I thought they were made in Fort Lauderdale. Now I know that they are made in Haiti.... they are even MORE PRECIOUS now !! Thank you soooo much !! Thank you! I received my order yesterday and am amazed and humbled by the incredible artwork you've created...and even more so as I viewed the pictures of your workplace that was destroyed by the earthquake. Your pieces were all well-packed and each one is a treasure! See additional comments from our customers. 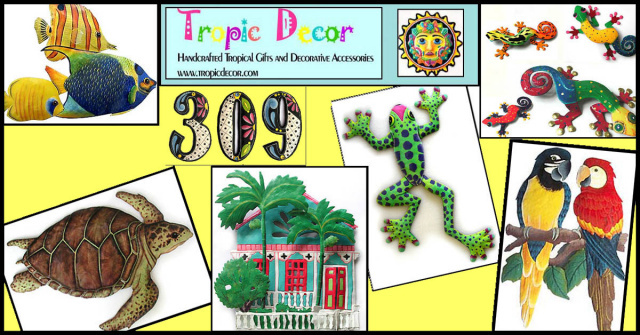 Tropic Decor offers a wide variety of handcrafted metal garden art, outdoor wall decor, and tropical gifts to give your home a touch of Caribbean decor. Tropical wall decor adds a refreshing look to your tropical home decor. Haitian metal art. Our tropical metal art designs are handcrafted in Haiti, using recycled empty 55 gallon steel drums. The drum is filled with dried banana or sugar cane leaves, that are then set on fire to rid it of any residue. The steel drum is then cut open and flattened and the design is drawn on. Our skilled metal artisans cut the design, using hammer and chisel. The detailed hand painting is carefully applied, followed by a protective coat of polyurethane varnish. You will appreciate the quality of these attractive Caribbean steel drum art designs in your tropical home decor or as a unique tropical gift for a friend. High quality Haitian metal art. Your credit card information is secure on our website.